Julian of Norwich is a medieval English mystic who celebrated “Mother Jesus.” It’s not known if Julian herself was queer, but her ideas were. Julian is often listed with LGBT saints because of her genderbending visions of Jesus and God. Her feast day (May 8) always falls near Mother’s Day (May 12, 2013). Her discussions of Jesus as a mother sound radical even now, more than 600 years later. In today’s understanding, Julian’s Jesus seems to be transgender! Her omnigendered vision of the Trinity fits with contemporary feminist and queer theology. Mother’s Day is also a great time to honor mothers whose love for their gay children helped launch LGBT organizations, including: Jeanne Manford and Adele Starr, founders of Parents, Families, and Friends of Lesbians and Gays (PFLAG); and Edith “Mom” Perry of Metropolitan Community Churches (MCC). 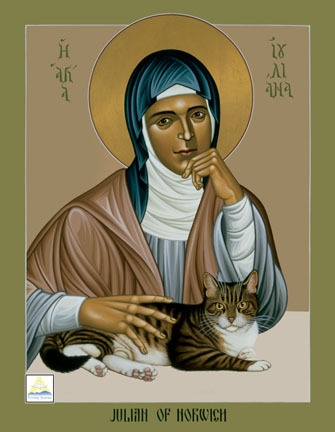 Julian of Norwich (c.1342-1416) is the first woman to write a book in English. The book, “Revelations of Divine Love ,” recounts a series of 16 visions that she experienced from May 8-13, 1373 during a severe illness when she was 30 years old. The book includes Julian’s most famous saying, “All shall be well and all shall be well and all manner of things shall be well” -- words spoken to her by God in one of Julian’s visions. Later Julian went on to become an anchoress, a type of recluse who lives in a cell attached to a church and does contemplative prayer. Her hermit’s cell was at the Church of St. Julian in Norwich. The cell had two windows, one opening to the church and the other opening to the street. She became known throughout England for the spiritual counseling that she gave there. Julian is considered the first Catholic to write at length about God as mother. Her profound ideas speak powerfully today to women and queer people of faith. “As truly as God is our Father, so truly is God our Mother,” Julian wrote. These quotes come from modern English translations of “Revelations of Divine Love” by Elizabeth Spearing and Clifton Wolters . For longer quotations Click here. In the icon at the top of this post, Julian looks out the window of her cell with her beloved cat. As an anchoress, she probably lived alone. It is said that the only other being to share her room was a cat -- for the practical purpose of keeping it free from rats and mice. A longstanding legend tells of Julian’s friendship with her cat companion. The icon was painted by Robert Lentz, a Franciscan friar based in New York. Known for his innovative icons, he was rebuked by the church for painting LGBT saints and God as female. This post is part of the LGBT Saints series at the Jesus in Love Blog. Saints, martyrs, heroes and holy people of special interest to gay, lesbian, bisexual and transgender (GLBT) people and our allies are covered on appropriate dates throughout the year. I always get a "lift" when an icon of a "Contemplative with a Cat" comes up in the "rotation", because my own cats are such an important part of my own Centering Prayer practice. 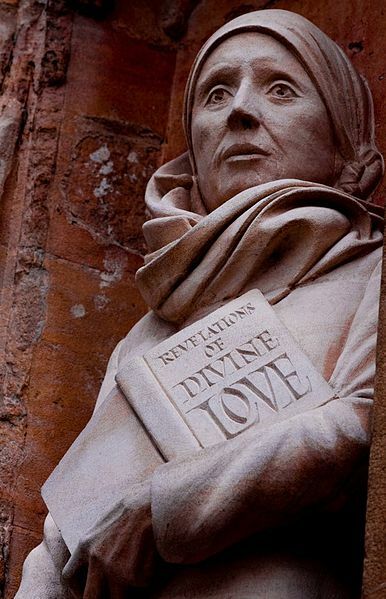 Last year I was blessed to participate in a three-day retreat about Julian of Norwich, and this blog reminds me that it is time to revisit her writing again. Trudie, I really like the icon with the cat too. It also reminds me of the many cats that you have sketched in your pet portraits. I am also getting into the rhythm of the saints as I update and repost them each year on their feast day. It gives me a whole new sense of time.